Product prices and availability are accurate as of 2019-04-21 14:52:39 UTC and are subject to change. Any price and availability information displayed on http://www.amazon.com/ at the time of purchase will apply to the purchase of this product. Classic and sleek Texas ranger style oil-tanned genuine leather ranger belt. Matching 4-piece Silver-finish western style buckle set. 1-1/8"(30mm) wide tapers down with billets at 3/4" for the buckle and tip ends. Measure around where you wear the belt, with your pants on, and order that size. 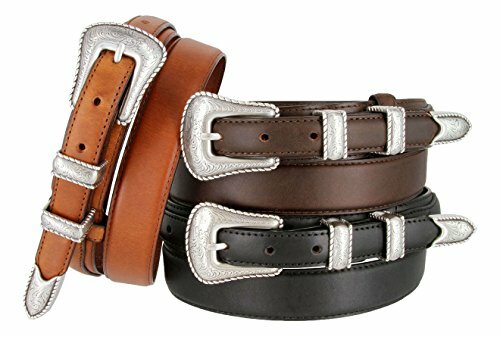 Oil-Tanned Genuine Leather Matching Silver Finish 4-piece Buckle Set 1-1/8"(30mm) wide belt strap with a 3/4" billets on buckle and tip end Heavy-stiched edges for durability This belt is measured from the fold to the center hole. Measure where you wear the belt in order to get the best size.